Gravity is the force that causes objects to fall towards the ground. Observations of the movements of the planets led Isaac Newton in 1687 to publish his formulation of the force between two objects caused by gravity, stating that the force is proportional to the masses of the objects and the reciprocal of the square of the distance between them. This simple relationship has been wildly successful, although it was superseded in 1915 when Albert Einstein published his general theory of relativity. Einstein’s model differs from Newton’s only by imperceptible amounts, except when extremely large masses or speeds close to the speed of light are involved. For something the size of Earth, Newton’s law of gravity works just fine. Given Newton’s law, some relatively straightforward vector calculus can be used to prove Gauss’s law for gravity, which gives a relationship between the gravitational flux of an enclosed surface and the amount of mass inside that surface. For symmetrical cases like spherical objects, the gravitational flux is just the gravitational field strength multiplied by the surface area of the sphere. The details are not as important here as the result: For a spherical object, the gravitational force of the object at any point—outside or inside the object—depends only on the distance from the centre of the object and the amount of mass within a sphere of that radius. So consider the Earth – assuming it’s spherical. If you are on the surface or above it, the gravitational force you feel is produced by the entire mass of the Earth. However, if you are beneath the surface of the Earth, all of the mass of the Earth at shallower depths has no effect on you – the gravitational pull in all different directions cancels exactly to zero. You only feel the gravity from the part of the Earth that is deeper than you are. This means that as you burrow deeper into the Earth, the gravitational force you feel decreases, until eventually, if it were possible to reach the centre of the Earth, it would be zero. On the other hand, if the Earth is flat there’s no a priori reason to think that gravity should get progressively less strong as you go deeper underground. 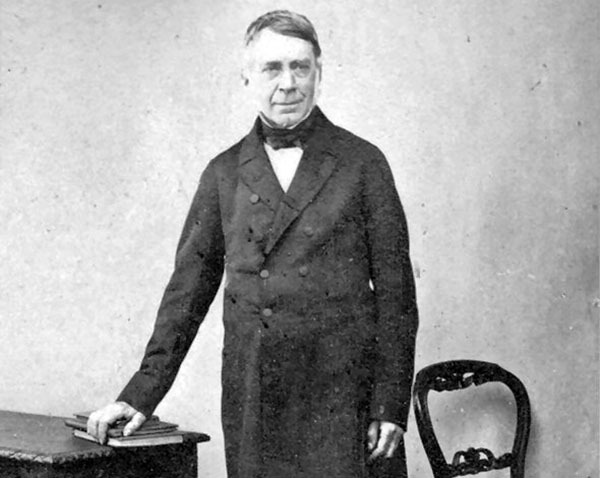 But in the 1820s the British astronomer George Biddell Airy realised that if you measured the force of gravity at the surface of the Earth, and also down a deep mine, you should get two different values. Not only that, but the size of the difference and the depth of the mine could be used to calculate the density of the Earth. He began experimenting in 1826, but unfortunately his first attempt failed due to a mine flood. Airy was a busy guy, accepting the post of Astronomer Royal in 1835 and discovering and inventing a whole bunch of other stuff. But finally in 1856 he tried the gravity experiment again. Airy used a coal pit at the Harton Colliery, near Harton in the county of Tyne and Wear in north-eastern England. 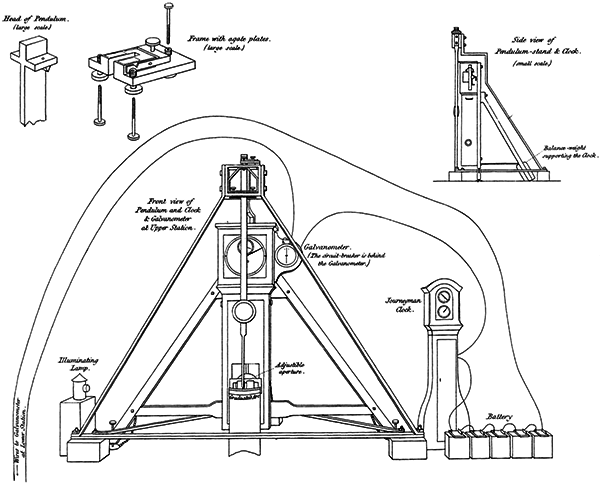 The pit was 1260 feet (384 metres) deep, and at the bottom Airy built a sophisticated pendulum and time measurement system. He compared timing measurements made at the surface and the bottom of the pit over a period of 60 hours with the same length pendulum, and discovered that the pendulum at the bottom of the pit ran slower by 2.24 seconds per day. 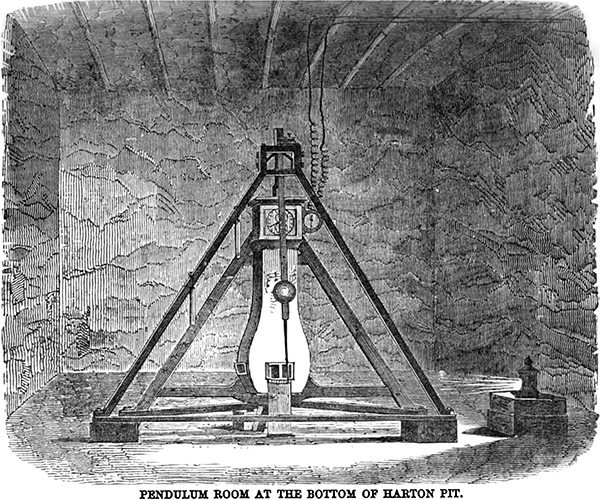 Airy’s pendulum apparatus at the bottom of the Harton coal pit. Figure reproduced from . For our purposes, this difference is the evidence we need that the Earth is spherical. 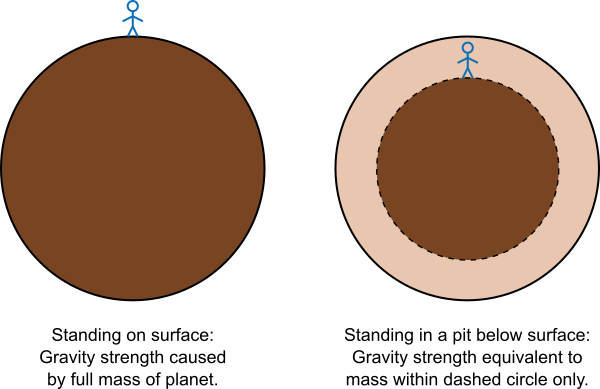 We predicted that if the Earth is spherical then gravity should be lower at the bottom of a pit than on the surface, and Airy showed that is indeed true. But he didn’t stop there, because of course he already knew that the Earth was round, and its circumference. With that piece of data and his pendulum measurement, he could calculate the density of the Earth, finding a figure of 6.62 times the density of water. As it turns out, modern measurements give a density of 5.51, about 17% less. Airy’s coal pit experiment was very fiddly, and it’s a credit that he got so close to the correct answer. Schematic diagram of Airy’s pendulum apparatus. Figure reproduced from . Now remember that previously we’ve shown that Eratosthenes measured the size of the Earth, simply using sticks and shadows. Airy’s experiment shows that once you know the size of Earth, you can get a decent measurement of the density of the planet using something as simple as a pendulum. And once you know the size and the density of something, its mass is simply the volume multiplied by the density. In other words, if you’re clever enough you can measure the mass of the Earth with a stick, a length of string, and a weight.